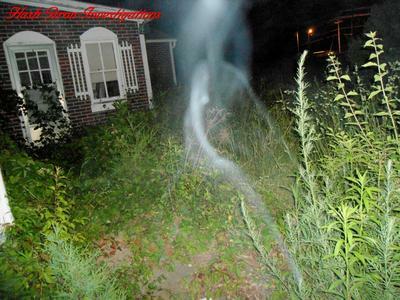 This picture came from outside a empty house I have investigated for over 2 years now, up to now I have done over 300 investigations, taken in the order of about 60,000 pictures and have over 600 hours of recordings so I have become pretty close to the more then 20 spirits that reside in the house and on the property. The best part is I can walk to it in about 10 minutes, and 95% of the time I am alone only with my dog ACE, he can hear, sense and see the spirits but that,s another story. One lady at the house is very friendly, her name is Edna and always telling me thank you and I love you, every now and then when I call for her I will catch a pretty good picture in the form of Ecto-plasma. This is one such time. Now I know this may have been heard in every paranormal movie ever made, but this is true, this house as well as several others were built over top a graveyard. Some bodies were moved but not many. I have recorded to date at least 60 spirits in and around this house, I have come to know them as well as them know me. Most like me but a few still despise and want me dead. The one in the picture is Edna and I had asked to take her picture. She is always sweet with me and sounds to be in her late 20's or early 30's.